With a culture of innovation, Dominion Packaging of Richmond, VA selected the latest technology in flexo printing to produce premium folding carton packaging for the tobacco, food and beverage markets when deciding its print direction.Its formula for success lies in the combination of state-of-the-art machinery and a market-focused strategy to provide exceptional product appeal.A key driver – to offer quality packaging at a modest cost – led the company to develop new technology using a flexo press operation capable of replacing jobs that were previously printed on both gravure and offset presses. The advancement is based on the successful installation of a TRESU Flexo Innovator press (FI1400-10, 55-inch, 10-units). The new Innovator is a flexographic in-line press equipped with rotec® High Speed Sleeves and rotec® Atlas Adapters from Flint Group.This particular combination of sleeves and adapters provides optimal control of plate bounce by absorbing press vibrations and providing added stability, thus permitting the press to run at faster speeds while still allowing for a solid kiss impression. The unique polyurethane composition of the rotec® High Speed Sleeve provides the compression necessary to reduce bounce-induced skipping (a common occurrence on press as speed is increased) and offers a wider impression latitude, which enables the printing of half tone images and solids on the same print deck with a consistent print quality throughout the job. Additionally, since the sleeve has a durable compressible surface, plates can be mounted to the sleeve using an inexpensive 5 mil transfer tape, rather than the more expensive cushion tapes. 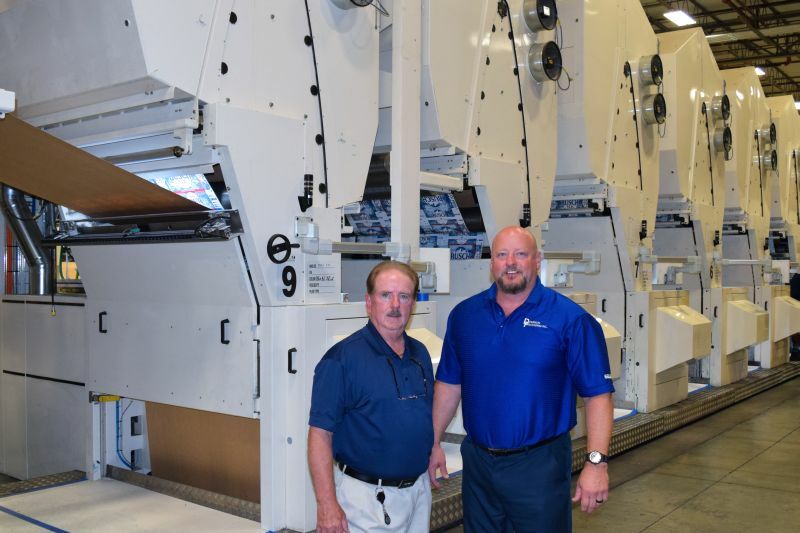 The relationship between Dominion Packaging and Flint Group goes back for over 20 years, and Butler is quick to attribute the technical expertise of Wes Johnson as being “instrumental” to the recent developments made at Dominion Packaging.